19 tracks: Cold Night In This Old Town * The Diamond * The Peat Bog Soldiers * Wild Mountain Thyme * Wheel Of Fortune * Lowlands Away * Lena The Whale (originally Sara The Whale) * Bonnyrigg Banker * Come By The Hills * Working On The New Railroad * The Road And The Miles To Dundee * Willie Brewed a Peck O’ Malt * The Greenland Whale Fisheries * Blow Ye Winds * The Hug Song * John Barleycorn * Plooman Laddies (with Barbara Dickson) * Caledonia * So The Years Roll On. The McCalmans, who retired in 2010, made 26 albums and recorded over 400 songs in their 46 years as professional musicians. Twelve of those albums were on Greentrax during the 24 years The Macs remained loyal to the Scottish label, plus the double compilation CD The Greentrax Years, released in 2009. Finding new songs was a group passion and because of the constant influx of material, many songs never made it on to a Macs album. This album has studio recordings, rehearsal recordings, live concert songs, songs from the Macs’ DVD The Final Concert Uncut - The Good Old Days , plus a couple of ‘cassette copies of cassette copies’, of which Ian McCalman says, “Please don’t sue us for the occasional hiss or bump: consider it as the gift of third generation analogue”. 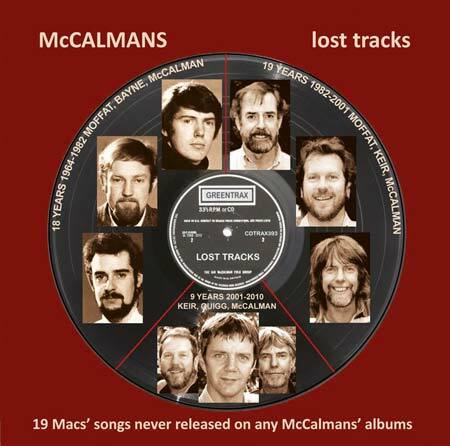 Lost Tracks contains 19 tracks of the first, the second and the final line-up of the group and it is quite remarkable that there were only two line-up changes in 46 years, especially when you consider that one of the changes was due to the untimely death of the great Derek Moffat. The album includes tracks from the three line-ups, plus a guest appearance by the wonderful Barbara Dickson who often sang with the Macs in their early days. There is a mixture of traditional songs and contemporary material, including of course contributions from the pens of Ian McCalman and the late, sadly missed Nick Keir, two prolific and brilliant songwriters. Pride of place goes to Nick on track 1, with the stunning Cold Night In This Old Town. The search through hundreds of tapes, minidiscs, LPs, CDs, videos, PC files etc for ‘lost’ tracks was made by Ian McCalman, who also edited and mastered the album at his Kevock Digital Studio, Lasswade. “Dehissers, denoisers, noise gates, decracklers, de-dogbarkers, smoke and mirrors were all used in the making of this album”, says Ian, who has dedicated it to “our two sorely missed friends, Derek and Nick”. This will be a rare treat for the legions of McCalmans fans who were saddened by the demise of the group in 2010 and feared there would not be another Macs album. Ian Green was knocked out when he received the finished article from Ian McCalman, not only because of the remarkable quality, even those from non-professional sources, but because here we have vintage Macs from their three line-ups and more. It re-emphasises, if that is needed, the very fine voices that have been a feature of the group throughout the 46 years. This is vintage stuff and Ian McCalman is to be congratulated for pulling it together. The clever front cover, showing the three line-ups and the years during which they performed, is by the multi-talented Ian McCalman. Ian Green says “It has been an amazing experience working with this totally professional outfit for so many years and I am indebted to Ian McCalman for trusting me with their Lost Tracks”.